One of my favorite creative habits in summer is mom and me craft-time. Well, it’s a favorite any time of the year but in summer we often set up camp in the veranda of my parents house. If it’s a sunny day we open all the windows and soak in sun. Both mom and I adore the heat. 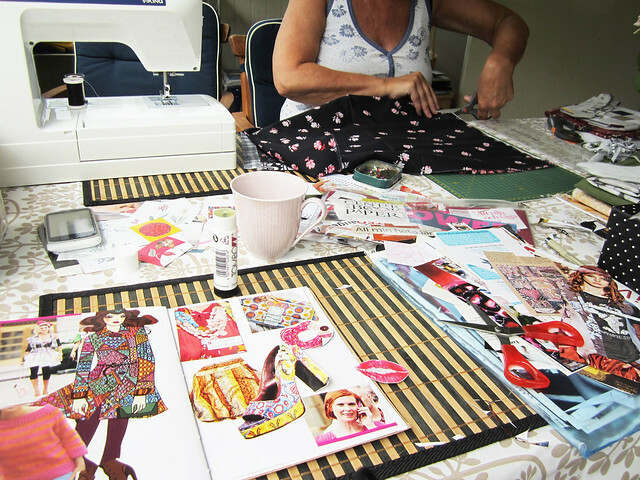 I bring up mom’s sewing machine and we listen to music, talk, and create together. Early in the day we have coffee and later, before dinner, we have drinks. Sometimes we work together on similar projects, sometimes just side by side. This time mom was working on one of her quilt projects (more pot holders!) and I brought my glue stick. With a whole bunch of magazine clippings and a hand bound notebook I started to fill the white pages of my Inspirations Book (number 1). Everyone needs this kind of notebook where you collect images and ideas that inspire you. The Inspirations Book is for images that I tear or cut out that totally inspires me (in some way or other) but that I don’t want to use in my art journal and doesn’t really fit anywhere else (collages etc.). I’ve made many diary collages in the past years, but with that kind of gluing I have to look through a lot of journals to find the collages in between the writing. In this notebook I will only glue things that really speak to me. It’s so much fun filling it and going through my stacks of clippings. A peek into one of the spreads in my Inspirations Book. 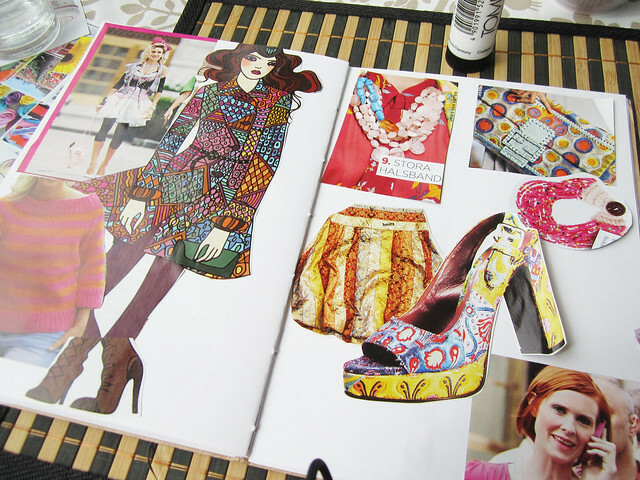 I call this section “fashion” but really it’s the DIY potential, the colours, and ideas in the images that inspire me. These images makes me want to dig into my fabric stash, create and explore colours for my wardrobe even more! I will write more, and show you more of this glue book another time. Do you have a similar idea and inspiration notebook? This entry was posted in Creative habits and tagged creating together, glue book, glue stick, mom, summer, the veranda. Bookmark the permalink. I love this kind of notebook, Hanna. I’ve kept many over the years, especially for home decorating and crafting. I have a separate notebook just for Christmas, too. They are so fun to flip through, especially years later when my tastes have changed and I wonder why on earth I chose some of the images to save! 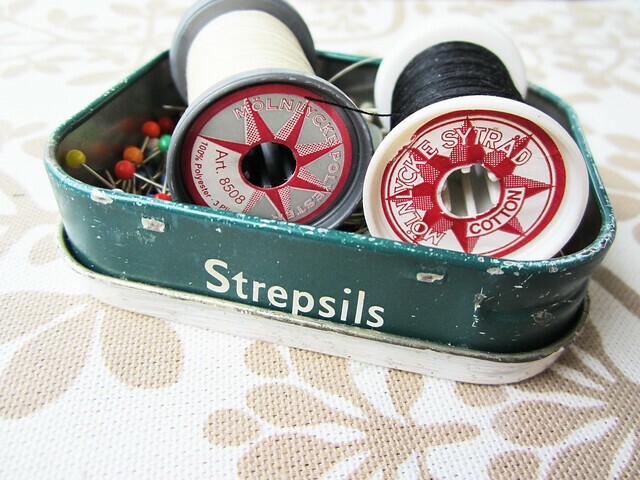 Those old Strepsils-tins sure inspire me! I don’t know what is it about them but I just L O V E them and other similar mint tins are equally great too. I’ve meaning to make an inspiration book myself but so far haven’t got to it yet. I’ll try to catch your inspiration to energise mine! oh, yes, I have a little (pink!) 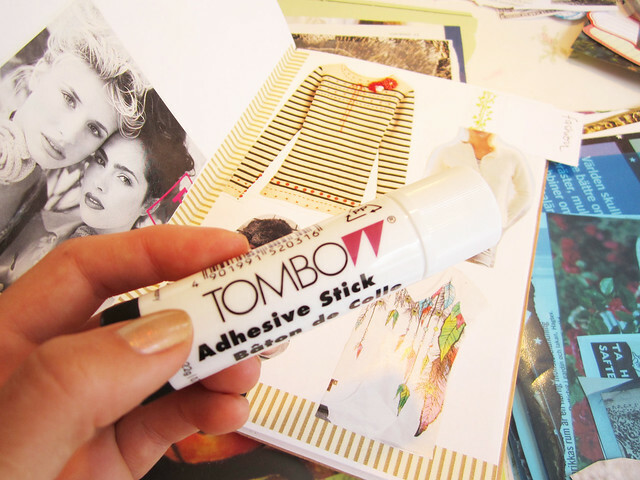 notebook where I glue images that inspire my crafting (mostly sewing). I love putting together journals of inspiration. I just finished one with pictures of other peoples art journals that inspire me, and I have a lot with decorating ideas that I love. It’s so addictive to put these kind of journals together. I just love the pictures of your inspiration book! Fin gemenskap! Att skapa sida vid sida. Craft time with mom sounds so awesome.. and fun!! Craft with mom ..really sounds great for me.